Meetings will be held every 3rd Monday of each month. The location will most likely be changing, but until we have a new location they will continue to be held at the Friends Meetinghouse. The next meeting will be October 21, 2013, all are welcome! There will be a potluck starting at 6:00pm, followed by the meeting at 7:00 pm; come for both or just the meeting, whichever works best for you. 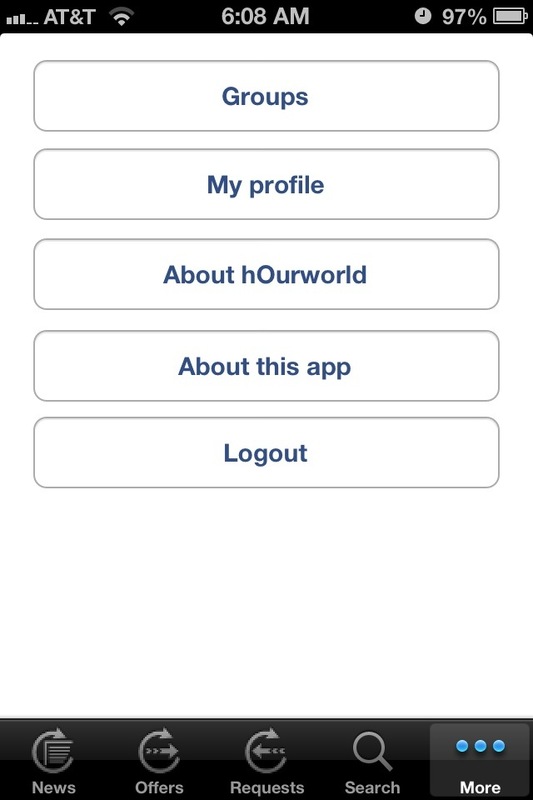 The mobile app was discussed, this is very new so don’t hesitate to contact hOurworld if you come across anything not working correctly or if you have any questions. If you don’t feel comfortable contacting them yourself please let us know and we will relay the information. There is also still some concern on how to use the Time and Talents software. I have included some helpful links to hopefully answer some questions. Don’t hesitate to contact us if you have any questions or get confused. While we continue on the logo and mission statement a template for temporary business cards have been created, you can download the template here. Print them out and spread the word! The marketing committee is hard at work getting everything done for the logo and we are lucky to have Marc on board from Marc Laucks and Company, Inc. helping with the design. We are still in need for some alternate meeting locations, the meeting house doesn’t heat well so once it starts getting cold we may want somewhere warmer. So, if anyone has some ideas, please let us know. 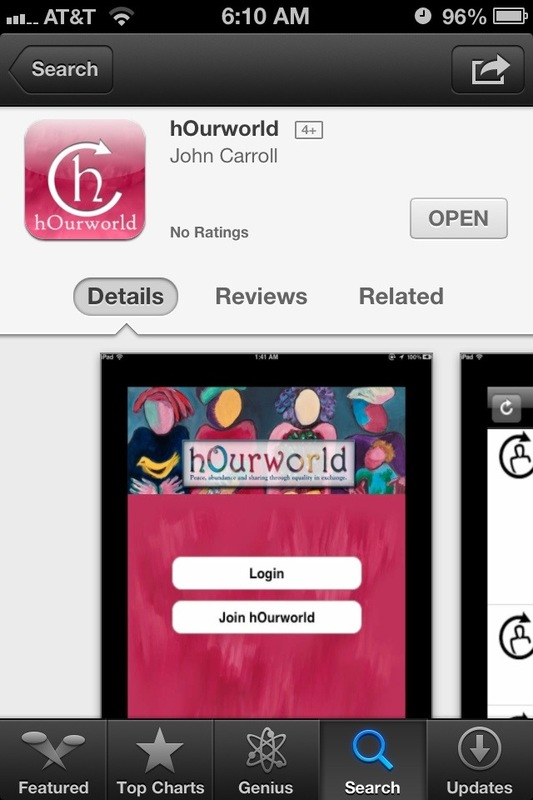 Yesterday the news was shared that hOurworld has gone mobile, and if you are anything like me that is very exciting news! I’m not often near a computer but I always have my phone. I took the time to download the app and play around a bit, so I thought I’d share just how easy it is to use. The app is available in both apple and android markets, Gracie shared an email and post yesterday that had a link. They link was for a survey, fill out the survey (you get a half hour for doing so) and at the end you will see links for the app. You could just search for the app, but why not take the time and gain a half hour? Once you download the app, you just need to enter your log in, or you can even join if you haven’t already done so. Once you enter, you can see new messages, offers, requests and even your profile. I searched offers and requests, I took the time to respond to a request as well as add my own request. You can even log your hours right through the app. When responding to a request, it will redirect you directly to your email. So that’s simple. What I did find frustrating was when I wrote my own request it doesn’t drop down, meaning it is shown as one long line of text. This made it really hard to edit and review what I wrote. (So yes my request has some grammar and spelling errors.) I also couldn’t go back and edit the request after I posted it, or at least I could figure it out this morning. If you are a member of a group, you can send messages to your fellow group members. 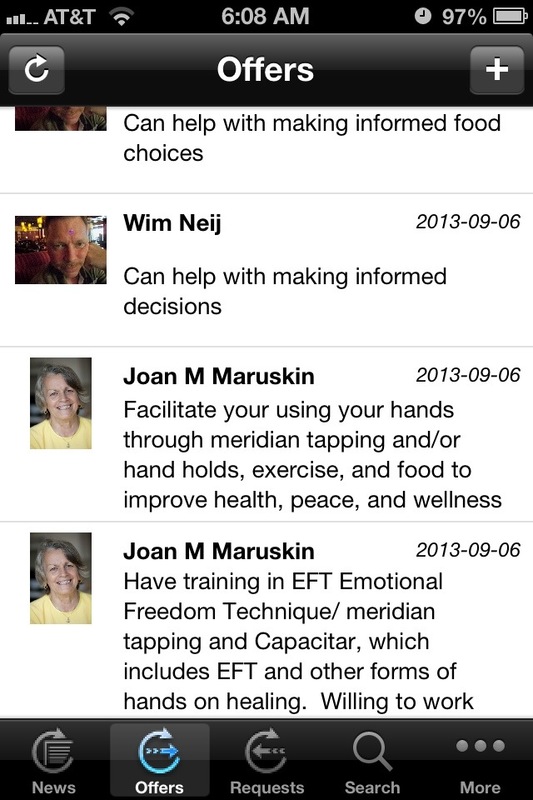 You can email individuals directly, you really can do everything you could online on the app. I know, personally, I will use the app way more than the website. I do most things through apps, this blog, my personal blog, emails, social networking…basically everything. So with that being said, play around with it…let us know what you think! 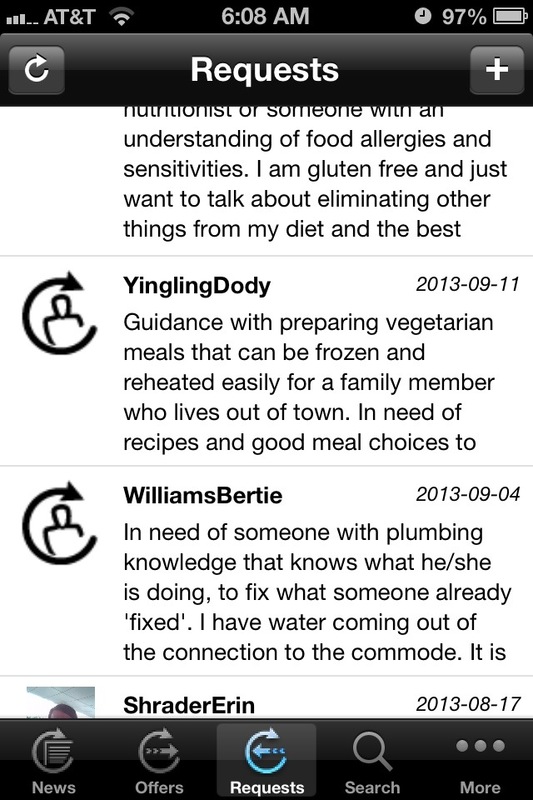 members’ input to help us understand your practices and needs better.